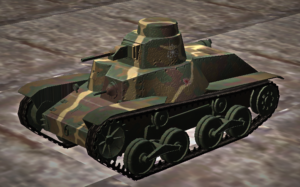 The Type 95 Ha-Gō (九五式軽戦車 ハ号 kyūgo-shiki kei-sensha Ha-Gō) (also known as Ke-Go) is a light tank used by the Imperial Japanese Army in combat operations of the Second Sino-Japanese War, at Nomonhan against the Soviet Union, and in the Second World War. It proved sufficient against infantry, but, like the American M3 Stuart, it was not designed to fight other tanks. Approximately 2,300 units were produced, making it the most numerous Japanese armoured fighting vehicle of the time.